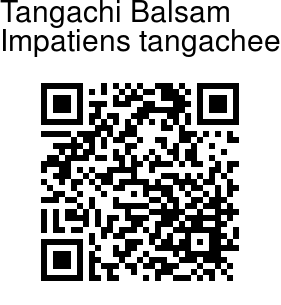 Tangachi Balsam is a herb up to 40 cm tall, with stems forked, creeping, rooting at lower nodes, hairless. It is named after Tangachi Malai peak in the Anaimalai Hills of Tamil Nadu. Flower-cluster-stalks arise in leaf-axils, stout, 4-16 cm high, exceeding leaves; bracts ovate, leathery, persistent. Flowers are borne 4-8, in racemes or umbel-like clusters, bright rose; flower-stalks erect, 1-2.5 cm long. Lateral sepals are round-oblong. Standard short, broad. Wings 2-lobed; basal lobes broadly flat; distal lobes flat with erose tip. Leaves are crowded towards tip, obscurely whorled, alternate, nearly stalkless, elliptic-tapering at tip, sawtoothed along margins, 3-10 x about 1.2 cm; nerves few, slender. Capsules gibbous, hairless, about 8 mm long; seeds many, small. 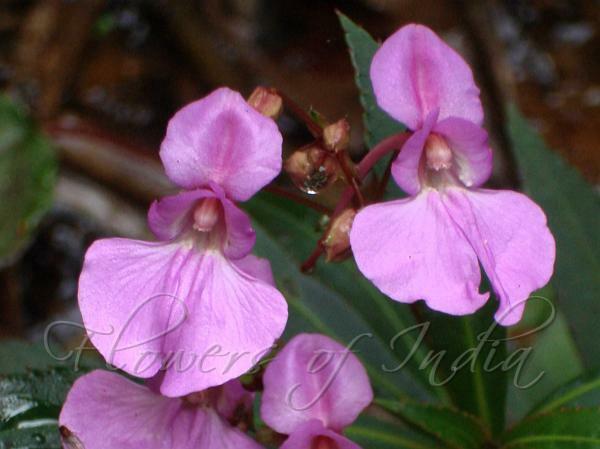 Tangachi Balsam is endemic to W. Ghats, found in Anamallai and Pulneyhills, in Tamil Nadu and Kerala, along streams and riverbeds at an altitude of 1700-2100 m. Flowering: September-February.